Its REALLY refreshing to finally have a pre-order date. I am still leaning towards holding out for the Vive. I'm waiting for the final specs and hardware for the Vive before considering buying it. Plus, I want to see what's this big announcement for CES that is so monumental that they had to delay shipping - it better be something revolutionary. Any guess on what the price tag will be? Palmer is quoted as saying it's "More than $350," so I'll take a wild stab at $350.1 -- hey, it could happen! Oculus released some new photos of the Touch and it shows them adding some new things like hidden tracking LEDs, Oculus button, and what appears to be speakers. Am I the only one who will order at 8:00 am (pacific time) on the dote? It'll be interesting who can input their order information the fastest And Palmer just confirmed that the pre-orders will be global. Definitely getting it on the dot. The Vive room VR doesn't interest me and I assume their breakthrough is related to that. Also, the Oculus would be quite gimmicky to me without the Omni on the horizon. So good work Omni team! 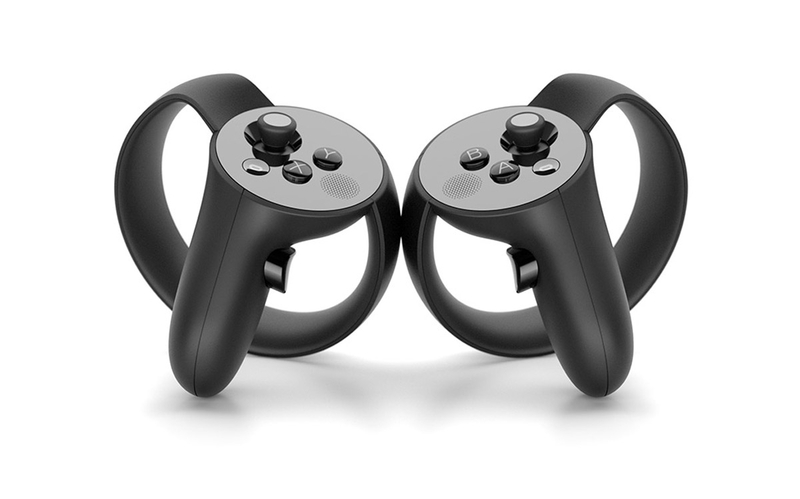 I am still concerned with the 360 degree tracking of the Oculus Touch controllers. Yeah, maybe they somehow solved that "bumping into furniture" while walking around problem. I really don't like the point-and-click or teleportation progression system that some developers are using in their games. Which goes to your point about the necessity of the Omni. I'm bullish on the Vive but their HMD and controller are just so big and unwieldy. Final hardware at CES would be nice. I agree with Tomek about getting more than one camera if required but I would really prefer not to. Well the Rift comes with one and Touch also comes with one. So the default is 2 but everything they have said they are both to be on your desk facing you the same direction and not set up like the lighthouse sensors. The tracking in the 300-ish degrees that the cameras can see is very good, just as good as the Vive, or so people say, the issue is when you turn around and your body is blocking the cameras. LOL @kzintzi outsourcing the F5'ing I like it. 4 cameras is not a big deal, I will get 4 lighthouse stations if that helps even a little bit. The problem i have with that and the Rift is that's allot of USB ports and and metric crap-ton of USB cables. I am not trying to bash the Oculus or the Rift. I am just a little concerned that's all. If you were an original DK1 Kickstarter backer don't bother pre-ordering -- you're getting the new rift for FREE! That is classy, well played Oculus. "To claim your free Rift, fill out the survey you’ll receive from Kickstarter before February 1, 2016 and provide a shipping address that is located in one of the 20 countries Rift is launching in. For those who don’t live in one of those 20 countries, we’re working on an alternative, and you can let us know your preference in the form." Some more good news: you'll also get a free copy of Lucky’s Tale and EVE: Valkyrie just like those who pre-order. There's no word yet though on whether the carrying case is included. Here's Palmer tweet: "People really loved the carrying case we included with DK1 and skipped for DK2, so good news: It is coming back, and doper than ever!" Here's the list of the 20 countries that can pre-order: Australia, Belgium, Canada, Denmark, Finland, France, Germany, Iceland, Ireland, Italy, Japan, Netherlands, New Zealand, Norway, Poland, Spain, Sweden, Taiwan, United Kingdom, United States. Oculus hopes to add more over time. I get that everyone is excited (me too) but really, it's just better tracking + better screen than the DK2. Probably more comfortable. Happy to be getting a free one (Thanks Palmer!) but really, the big thing I need are the touch controllers. Room scale tracking. That's really the revolutionary step forward. The AR I'm sure is interesting too, in the Vive. Not sure what'd I do with it though, for a game. Vive makes more sense for Omni users, but Vive is being pretty tightfisted in handing out their dev kits. I think they should have given out the kits to people they wanted to but also allow people to just buy the damn things. Assuming that I have a Samsung Galaxy S6, should I still go for the Oculus Rift, or would a Samsung Gear VR suffice? Question is, then, do they both do the same stuff? Yes, the Gear should definitely work with the Omni. http://www.virtuix.com/bluetooth-and-samsung-gear-vr/ It's particularly a good use case because of the lack of cables. You won't have any positional tracking, however. They both do completely different things, well almost some games will work on both but not many. The Gear VR and Rift/Vive are very different. Gear VR is for mobile VR. VR you can take and use anywhere. It is self contained, it does not need an external computer, It uses your phone as the screen and as the computer to do the processing needed to run the games. This is nice because its wireless but the tradeoff is that the relative low processing power of the phone limits your experience. It also only has 3 degrees of tracking instead of 6 and is a bit heavy do to having a phone hanging off your face. Now the Rift/Vive on the other hand require a high end PC to do all of the necessary processing. This limits where you can use the HMD this has the added benefits of having massively more processing power as well for arguably a much better gaming experience. they also have 6 degreas of tracking, not just 3. They also(or at least will) have independently tracked controlers as well as better screen's/optics and the ergonomics are better as well again do to not having a phone hanging from your face. Unity is a good platform for building to both the PC and Android. If you don't optimize for Mobile though, the FPS rate can suffer a bit. According to Palmer, "When you preorder Rift, you also reserve your spot for Touch preorders. First in line for Rift=First in line for Touch." I don't think it's mandatory that you have to buy the Touch when pre-ordering the Rift; it's probably just an option. Yeah, 499 is the consensus number. I probably would have had to buy it for the better tracking. Prefer a Vive, though. 499 is not too bad but still up there in price; more expensive than a console, however. Not to mention the price of the Touch. I want to know more about the final Vive as well. Sony's press conference is live now so let's see if there's anything on PS VR.